Originally published under the title "Trump Told the Truth in Saudi Arabia. What Happens Next Could Be Interesting." 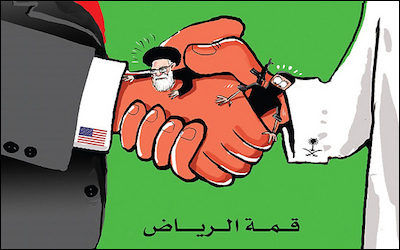 A cartoon in the Saudi newspaper Al-Madina sees the new U.S.-Saudi partnership crushing both ISIS and Iran. In Riyadh on Sunday, President Donald Trump, the man who once called for a ban on all Muslim immigration to the U.S., was the most wildly--and warmly--received American leader in the region's history. Out with the until-now wrongly controversial "radical Islamic terrorism." In with "Islamist" ideology and "Islamic terror of all kinds." And none of the fifty or so leaders Trump addressed at the first Arab Islamic American Summit walked out, or even seemed to flinch at his words. In fact, they warmly applauded a speech that rallied them to "DRIVE THEM OUT" (all caps in the official White House transcript), meaning our common enemies, from their own midst, as well as to confront former President Barack Obama's preferred partner, Iran. The reason for this is that Trump told them the truth--or at least more of it than they've heard from an American president before on this subject. Obama tried to avoid naming the Islamist ideology at the root of "radical Islamic terrorism," and hardly invoked Trump's key phrase at the summit, that this is a war between "good and evil." Trump employed even stronger language than he had repeatedly used in the presidential campaign. Contrary to the spin of many commentators, in the end, Trump employed even stronger language than he had repeatedly used in the presidential campaign--for he removed the qualifier "radical" from "Islamic." The White House has since tried to soften the very broad "Islamic" as a slip of the tongue from an "exhausted" president--but not so the more precise "Islamist." Regardless, Trump had it right--for while most Muslims, of course, are not terrorists, tragically most of the world's terrorists today are Muslims, who follow the ideology of political Islam, broadly known as Islamism. The global jihad comes from no other faith than Islam, which has so far failed to face this menace--"95 percent" of whose victims, the president rightly pointed out, are believed to be Muslims themselves. The Saudi government has done more to export radical Islamist ideology than any other in the Sunni Islamic world. And he said this in the capital of the nation whose own Wahhabi clerical establishment has done more to export the Islamist ideology that feeds it than any other in the Sunni world. The extraordinary climax came when Trump urged his powerful immediate listeners and their mostly Muslim, largely conservative publics at home, to stand together "against the murder of innocent Muslims, the oppression of women, the persecution of Jews and the slaughter of Christians." These are words, which, in that aggregate, especially when combined with a general call to arms against the terrorists, President Obama would never have uttered. Nor would he ever have (correctly) labeled those behind the Manchester bombing on Monday "evil losers in life," as Trump did in Bethlehem on Tuesday. Obama went to Cairo in June 2009 to woo Muslims in the first address by a U.S. head of state to the Islamic world--and wound up empowering the Islamists in the failed Arab Spring less than two years later. Above all, during his presidency, Obama deliberately enabled the Iranian regime--the Shi'ite Islamist foe that was the other great target of Trump's speech on Sunday--to ever more aggressively destabilize the region in his single-minded pursuit of a nuclear deal with Iran that gives the mullahs a legal glide-path to the bomb in little more than a decade. Trump failed to call out human rights abuses and terrorism financing by the Saudis and many in the audience. It remains to be seen if President Trump's failure to openly critique the human rights record of his Saudi hosts, or that of the Muslim world as a whole, or even to call out many in the auditorium themselves for financing or tolerating terrorism and the torment of minorities, will fatally undermine this fight. And we can only hope--and the U.S. must press King Salman to be sure -- that the huge $110 billion arms deal with the kingdom signed on May 20 is not the real incentive for this new united front, and that it is not turned to future use against Israel--where Trump headed next--as some in the Jewish state and elsewhere rightly fear. Yet it is no accident that a crucial triumvirate seemingly more inclined to confront terrorism strongly appeared to emerge at this extraordinary summit, held in the heart of the Islamic world, in the land where Islam was born. This triumvirate is Salman, who is much more liberal than the religious leaders in his country; President Abdel-Fattah al-Sisi of Egypt, who was the first Muslim leader to demand that the mainstream clerical authorities change their own extremist discourse; and the new American president with the strongest rhetoric yet against terrorism arising from the Islamic world. In that world especially, words can kill--as many liberal (and other) targets of the Islamists have sadly learned. We also hope that those of the ever-changing President Trump may help trigger a new form of "resistance" in the Middle East and beyond, instead of the one long directed at everything human in us all.